New Delhi: A day after signing a strategic partnership pact with New Delhi, Afghan President Hamid Karzai on Wednesday extended the olive branch to neighbour Pakistan, stating that the agreement was not aimed at Islamabad. Karzai said the pact with India signed on Tuesday was “nothing new" and that it only “put in words what we have been doing all these years". The statement assumes significance as it comes amid the fraying of already-tense ties between Islamabad and Kabul after the 20 September assassination of Afghan High Peace Council chief Burhanuddin Rabbani by a suicide bomber. Afghan intelligence had pointed a finger at Islamabad over the assassination. Many in Afghanistan accuse Pakistan of supporting the Taliban and allied groups such as the Haqqani network in a bid to undermine the Karzai administration and to influence government formation in Kabul after international troops leave the country in 2014. The India-Afghanistan pact aims to deepen trade, security and cultural links. The agreement is one of several being negotiated by Kabul, including one with the US, that are part of an Afghan bid for greater security. The pact sees India, which has given more than $2 billion (Rs 8,940 crore) in aid to the war-torn country since 2001, take on a bigger role in training Afghan troops and security forces—crucial in any post-2014 scenario. According to Afghan government estimates, Kabul aims to have 352,000 Afghan National Army and Afghan National Police personnel to take care of security duties by October 2012. India already trains a small number of officers from the Afghan National Army. Indian involvement in Afghanistan is extremely sensitive because Pakistan fears a decline in its influence in the country, strategically located between South and Central Asia. Pakistan has been keen to have a friendly administration in Kabul. India on its part, considers Afghanistan a part of its extended neighbourhood and is keen to have a neutral administration in Kabul. In his address, Karzai said India and Afghanistan have been engaged with each other over the past few years, during which India has offered more than 2,000 scholarships for Afghan students, built roads including the key Zaranj-Delaram highway, raised power transmission lines to Kabul, and built the Afghan Parliament building. “This is all strategic. Yesterday (Tuesday), we only put in words what we have been doing all these years," Karzai said. Noting that India has never said “no" to anything that his country wanted, Karzai said, “Afghanistan will not only not forget this, but remain grateful to India forever." Karzai stressed that the focus of his efforts in bringing peace to Afghanistan will now be focused on talking to the government in Islamabad, which he said had “unfortunately not yet received the result that we want". The assassination of Rabbani, Karzai said, has caused him to rethink his long-running strategy of trying to establish contacts with the Taliban to open negotiations. “We have now decided not to talk to the Taliban because we don’t know their address. When we find them, we will talk to them. 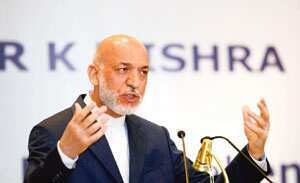 Therefore, we have decided to talk to our brothers, our neighbours, in Pakistan," Karzai said.